That's the verdict of BBC royal correspondent Jonny Dymond on the Duke and Duchess of Sussex's official visit to Morocco. It was a busy day with a lot of wardrobe changes as they made several stops - a selection of photos is attached below. The Duchess of Sussex is expecting her and Prince Harry's first child in April or May. 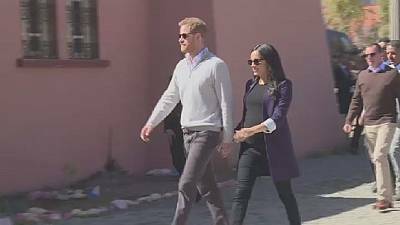 After arriving in Morocco on Saturday, the royal couple helicoptered into the Atlas Mountains for a visit to a girls' boarding house the following day. She later told the students: "We are very proud of all of you". On Sunday, the expectant royal stunned in a bespoke gold and cream dress by Dior to attend a reception hosted by the British Ambassador to Morocco at the British Residence in Rabat. "They are Patrons of charities for the disadvantaged", one Twitterian remarked, with another one engaging in speculation about how many impoverished people "would that money have helped", referring to the almost £400,000 that the baby shower reportedly cost. Along with the students, Fedal prepared Moroccan pancakes from Together: Our Community Cookbook, which was created to support people displaced by the 2017 Grenfell Tower fire in London, in collaboration with the duchess and London's Al Manaar, a Muslim Cultural Heritage Centre. "Should Harry and Meghan split, the future of the children would be decided in the same way as in any other divorce", Dave Rowlands, a monarchist, wrote on Quora, an online forum. Prince Harry presented the the Moroccan monarch with a letter from the Queen. A pal said: "The trip is a lovely chance to catch up with friends and spend time in a city she loves".